I found these in the grocery store yesterday. I would have bought them just for the package if they would have been cheaper. Sitsit - the Finnish eqvivalence of a Swedish sittning, a formal dinner. 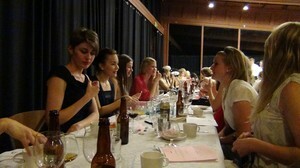 The all girls sitsit happened to take place the same weekend as it would back in Linköping. 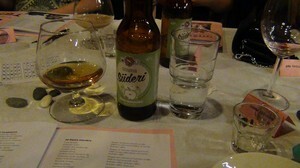 I got a bit worried first when I signed up for the sitsit, for instead of choosing between red/white wine, beer or cider as I am used to, I got to choose what liqor I wanted after finish singing songs and with the coffee, but it was fine. I had a good time! Apart from the extra glasses it was very important to toast with your table neighbours in the right order. Other than that there were no major differences. 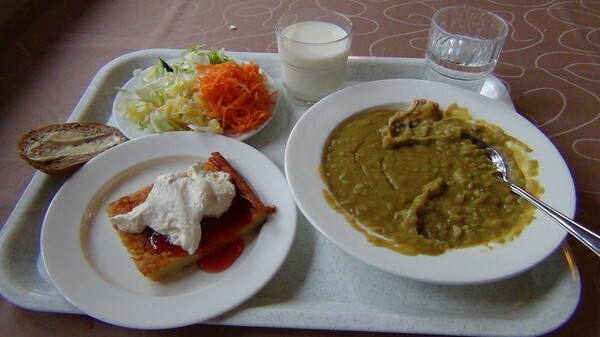 I think that I would run in to different sittnings traditions if I were to visit different universities in Sweden as well. Perhaps it would be enough to just visit another sektion. There was a lot of singing. 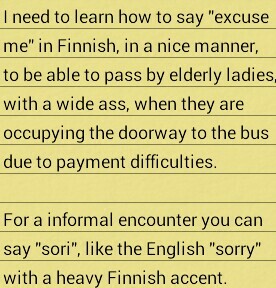 I hummed along and tried to pronounce the Finnish words. 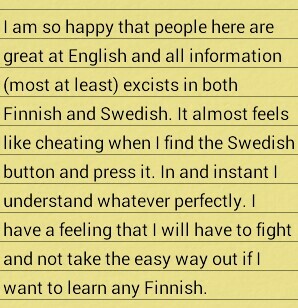 I had an exchange student next to me who is taken Finnish. She could pick out the numbers of what song we were singing and translate it for me so that I at least was trying to sing the right song. The native Swedish speakers here are members of something called Teknologföreningen. First I was not planning to go there since I am not really here to speak Swedish but after talking to a couple of members I feel like checking it out. 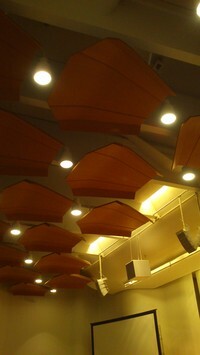 And it would be fun to go to a sitsit where I understand the toastmasters. 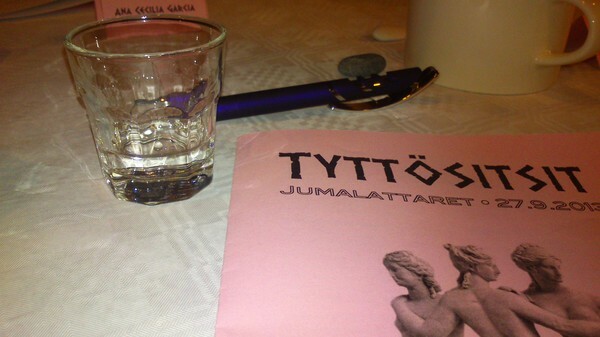 I have come to learn that Xylitol is a Finnish discovery. I have been informed about its good properties at two different times now, at the Fazer factory and by a Finnish teacher. For those of you who do not know what xylitol is, it is a natural sweetener often used for chewing gum (due to some chemical reasons they do not use it in the Fazer chocolate). 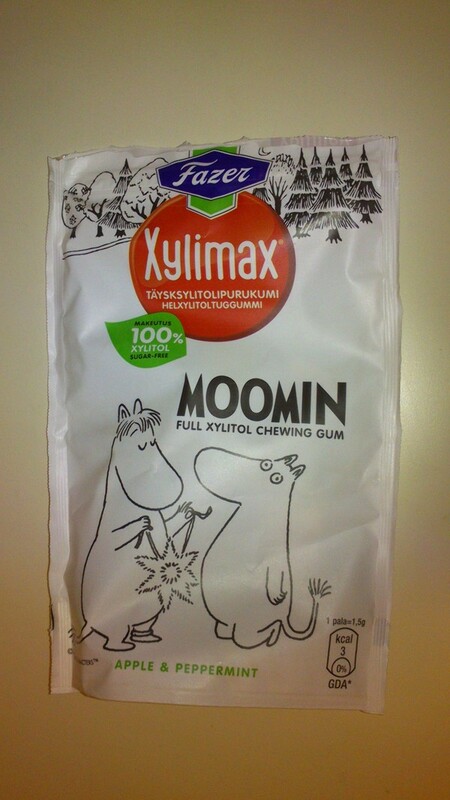 Finnish school children are more welcome to chew xylitol gum after lunch in school. Are your pupils allowed to chew gum during the school day Mom? Rosa, Maria's Finnish friend from Singapore that I adopted, and I went out for brunch this weekend. 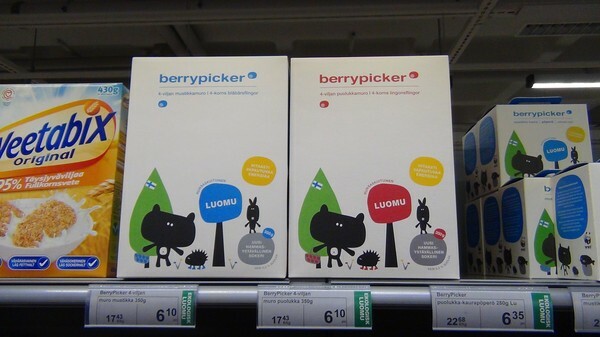 I was happy when I found something typically Finnish and got to try it. 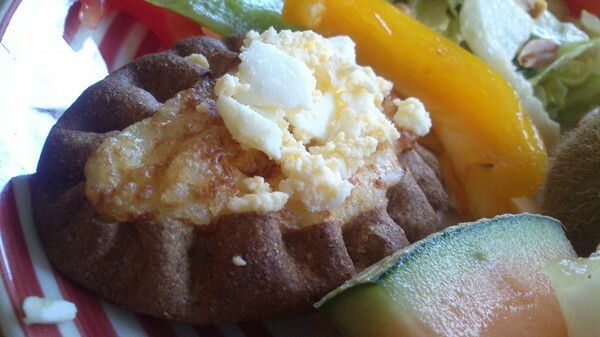 These are karelian rice pasties. There is a thin crust of rye bread filled with rice pudding. When you serve it you put a mixture of butter and boiled egg on top. I found it quite delicious and tried another version in the grocery store the other day. 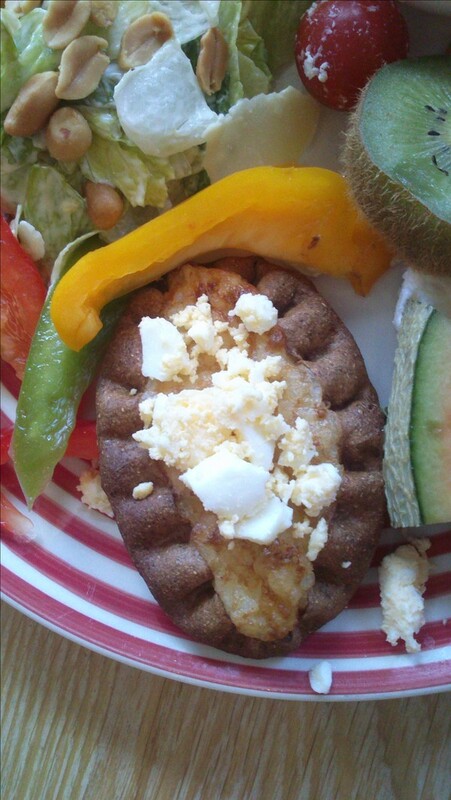 That one was filled with with carrots and potatoes so I beleive that there are som different versions. 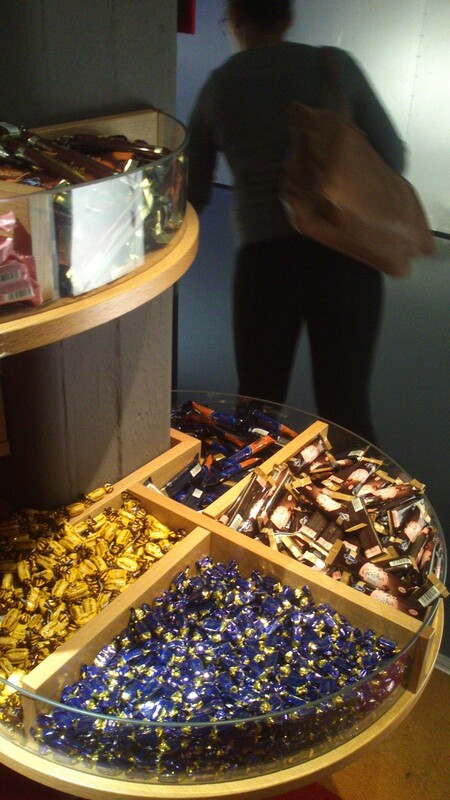 So yesterday I visited a chocolate factory, the Fazer factory. 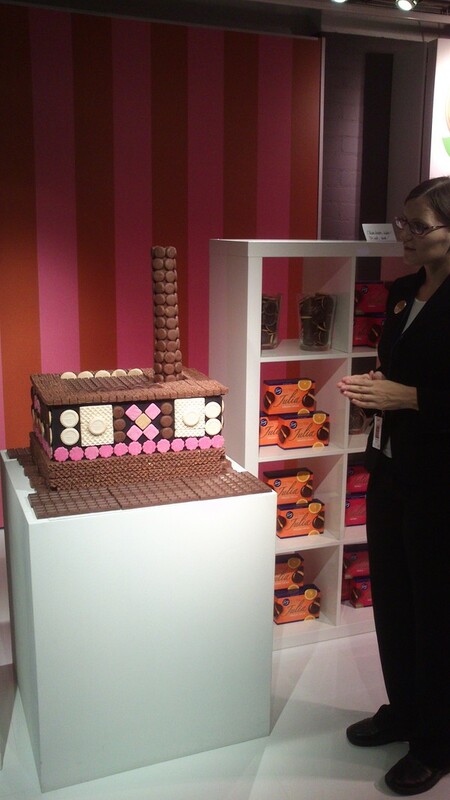 Fazer is the biggest chocolate producer and the most well known brand in Finland (they also make other sweets, cookies, bread, gum and serve lunch in canteens). The chocolate factory is in the outskirts of Helsinki so we had to take the metro (there is only one line which makes it very easy - you cannot take the wrong one) to the very end then a bus. 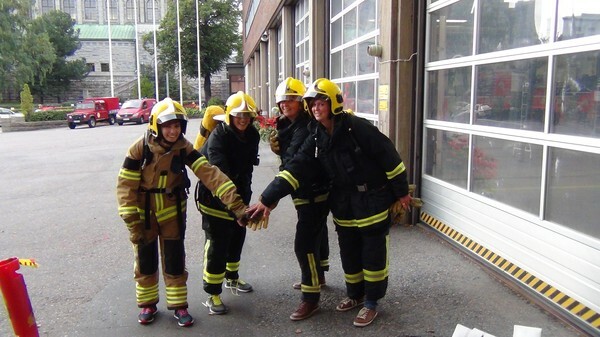 The trip was organized by ESN, Erasmus Student Network. I am actually not an Erasmus student but everyone is welcome. I did not know what the factory tour was going to be like but we were, as promised, allowed to eat as much chocolate as we wanted, with two exceptions. 1. We had to eat it at the chocolate eating station and were not allowed to take any with us from there. 2. 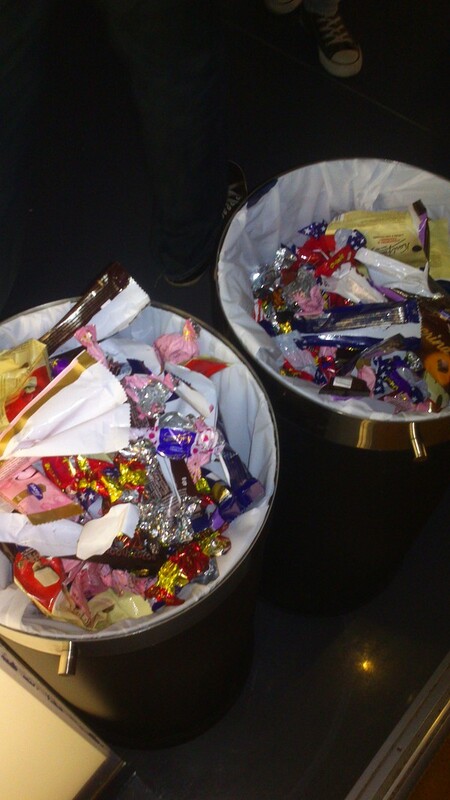 We could not drink anything which quite quickly suppressed the craving for more chocolate. Thank you Finnish people for bing Finnish and leaving an empty seat for me in the middle of the balcony. I officially have the best seat in the whole room! Being Swedish I would like to say that Finnish people are worse but to be honest I believe that we are equally afraid of approaching strangers. 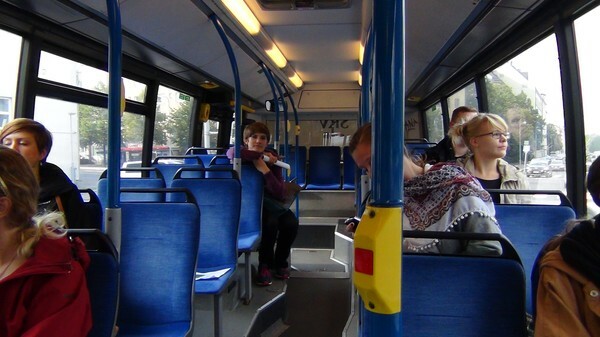 Here is Another example from the bus. 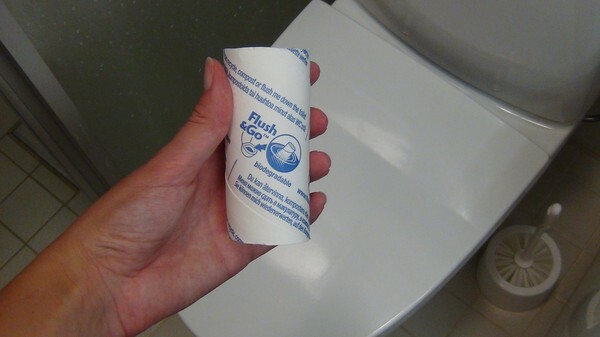 This goes against my instincts but it must be ok to flush the toilet roll it it says so. 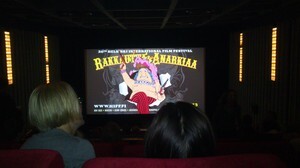 Helsinki International Film Festival 2013 - Love and Anarchy!! 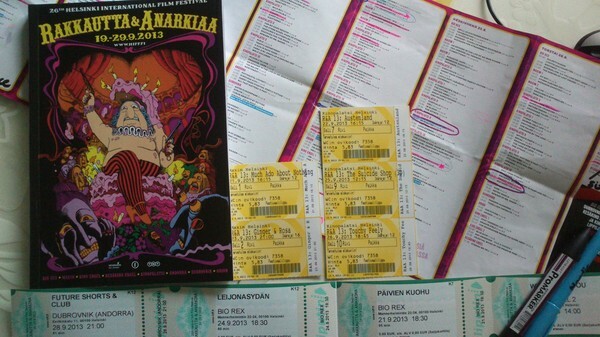 I got a festival package with a catalogue, a programme and 11 festival tickets of choice. So far I have seen three movies and booked another six. I think reading the catalogue and doing circles in the programme is as much fun as watching the movies. Who ever chooses the pictures and writes the descriptions for the films in the catalogue is the one who determines what I am deciding to see. The picture is crucial! When it comes to film festivals I rarely watch trailers - I read, look at the pictures and doodle in the catalogue. When I Saw You - About a young boy in Afghanistan in the 60's in times of war and the love between a mother and her son. I liked it a lot! Much Ado About Nothing - An American black and white movie based on a play. The dialogue was very quick and spoken in rhymes with a formal English. Without subtitles it was diffucult to understand it. I got bored and let myself take a little nap.The whole idea of the movie was fun though and towards the end I got some good laughs. Mood Indigo - Now I just got back from a cute and super weird French Movie with Audrey Tautou. It was a love story that took place in a playful fantasy version of Paris. 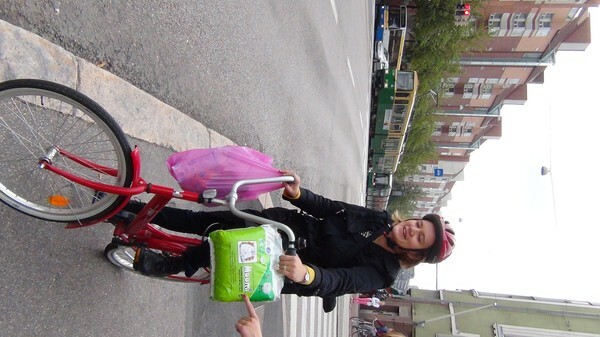 As a part of something called Helsinki Welcome Weeks, organized for all new residents of Helsinki, I participated in something called the Hidden City Race yesterday. I was assigned a team and a map with instructions. We had six hours to do tasks handed to us and visit check points spread out over the city. 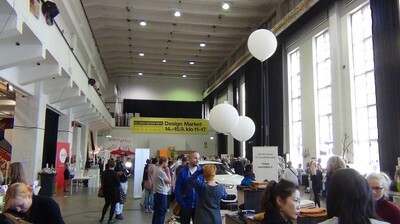 The theme was to discover the the history of Helsinki and design the future. I had a great time and made tree new friends. For two of the check points I got use of one of my former favorite interests - Geography. First when we were supposed to pair phrases, flags and pictures together for all Nordic countries, including Greenland, Sami, Åland and Faroe Islands. The second time when they handed us a map of Europe cut into pieces and we were supposed to puzzle it back together. 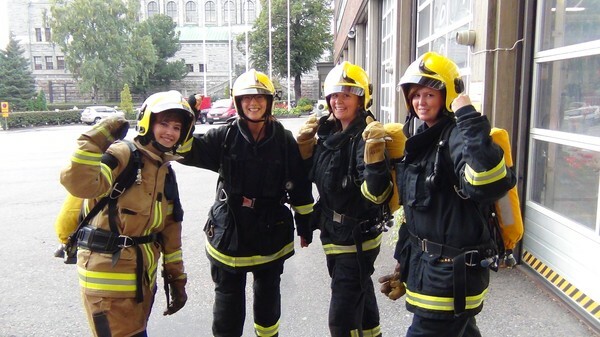 Other check points included charades, handing in a design suggestion for a statue, act out the whole history of the fortress Suomenlinna/Sveaborg, put on fireman gear (something I have always wanted to but to be honest it was not much fun, the gear was sweaty, smelled like smoke and was super heavy - after this I respect firemen even more than before) and rescue a doll etc. Between the check points we were supposed to collect business cards and find out the mood of the people we met. A guy from Hanken, Svenska Handelshögskolan, eating a Hessburger - The Finnish equivalence to McDonalds. This lady did not have a business card but when we started talking to her it turned out that she was a part of the group who organized the race last year. 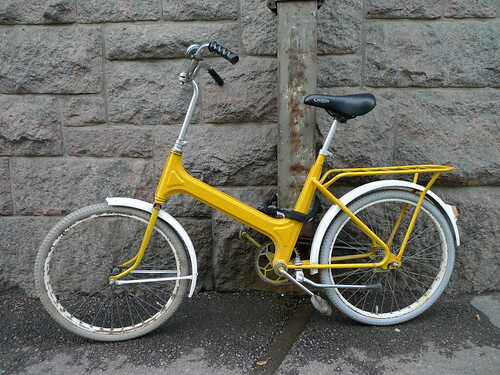 Notice her pretty Jopo bicycle and the Moomin diapers. Road workers who were happy that it was Friday. Right now I am taking four classes, about 11,5 hp total (15 hp was what I aimed for so my second half of the fall will be heavier). These four classes only resulted in five lectures per week. It is really nothing compared to what I am used to. In Linköping it is normal to be scheduled from 8 am to 5pm. I think I will have to study a bit more on my own, maybe pick up a course book and actually read it. So far I am enjoying my free time though ;) I ride the bus to school, go to my only class of the day, check the lunch menus on my recently downloaded campus lunch app, eat where they offer the best lunch and take the bus back to Helsinki again. 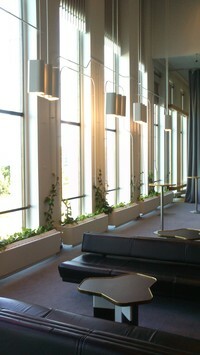 Aalto University has a whole department dedicated to forrest production so this course only touches the surface. So far it is very interesting. Wood might seem like a pretty low tech material when it is actually quite high tech. Today in class we talked about how wood can be used as insulation and thereby regulate the moisture level in a room and decrease cost for heating. This class might be a bit more theoretical that the one I would have taken in Linköping and it only corresponds to half of the credits so I might take a continuing course in the spring. This is a type of management course about information and how we share it with other people. The lectures would be more interesting if the professor was not talking with such a monotone voice. 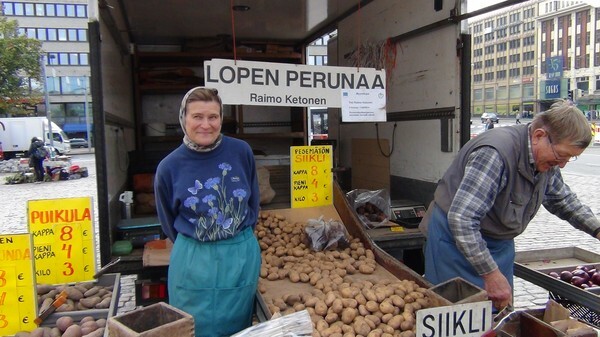 Finnish is a language without intonation which sometimes reflect also when a Finnish person is speaking English. Something new to me with this course are "learning diaries". They are a short reflective essay with a theme that you write inbetween the lectures, in other Words, once a week. I think it is a pretty clever way to force us students so grasp the content. I am not sure what this course really is about yet. It is supposed to be a management course but it feels more like something else. There has just been one lecture and I think that the only aim the lecturer had for the first lecture was to inspire us. He was mainly telling anecdots and saying things like "think outside the box" and "think like designers". There is going to be a project where we are supposed to develop the Finnish "baby box". This is the only class I have that will last for a whole year. Everyone calls it PDP and it is supposed to be a pretty intense product development course. The resources for this course are impressive. The 100 or so participating students from different departments and countries will be divided into groups of 10. Each group will be working towards a company and have a budget of 10000 EUR. 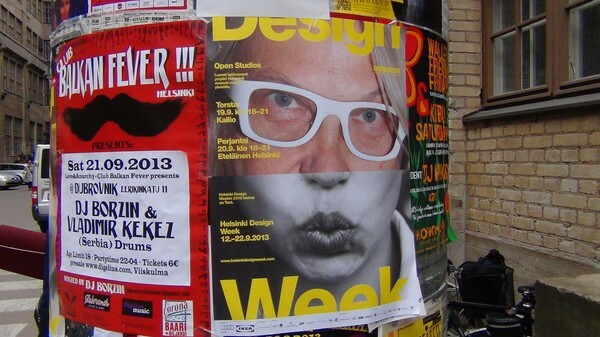 To our help there is a big crew of faculty and tutors and a building called the Design Factory. The Design Factory is this creative space with a stage, work spaces, small rooms for meetings, a room designated for Skype meetings, a knitting studio, a full kitchen where you can cook dinner with your group and then in the basement there is all kinds of tools and euipment for building stuff. The prototypes in this course have the chance to become awsome. I have to post pictures from this place!! PS. 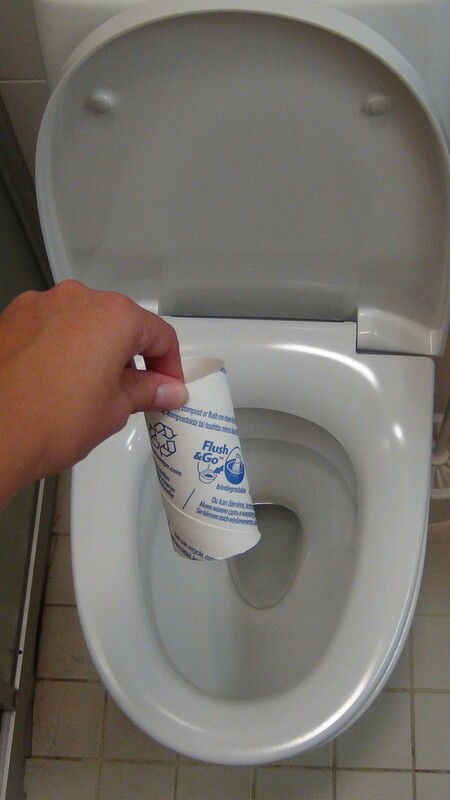 this has happened more than once. 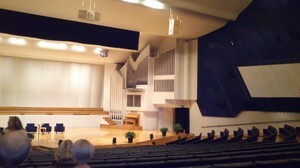 After two less fourtunate events at the Helsinki Design week, a non excisting fashion show(my fellow exchange students and I could not find it at least) and a guided tour of the Finlandia hall in Finnish (they guides were kind and did some English sum ups but it felt like we missed out on a lot of interesting facts about this Alvar Aalto designed building), the Design market was a success! It was super inspireing to be surrounded by a bunch of creative souls and their work of art. I especially liked some jewellry made from colored pencils. Fun idea! Besides collecting ideas for future design projects and birthday cards I purchased some cool gifts and a pair of earings for myself. If I was not a student and had my own appartment (where I would be staying indefinitely) I could easialy bought more than quite a few pices of neat furniture. At a stop, please give a clear signal to the driver early enough. Hold your hand up until the driver indicates to show that he/she is going to stop. Giving a clear signal is particularly important when roads are icy or it is dark. Use a luminous tag to improve your visibility. Once again I forgot this last night. I was standing by the busstop carrying one item in each hand and had no thought of raising either one of them to wave to the driver. So the bus just passed me buy. It is not like waving is something hard to. It is just that for almost 23 years it has been enough just standing there. I think that I have to start waving even when there are other people at the bus stop also waving. (which means that I really do not have to do it), just to practice and get a habit out of it so that I am fine next time by myself. 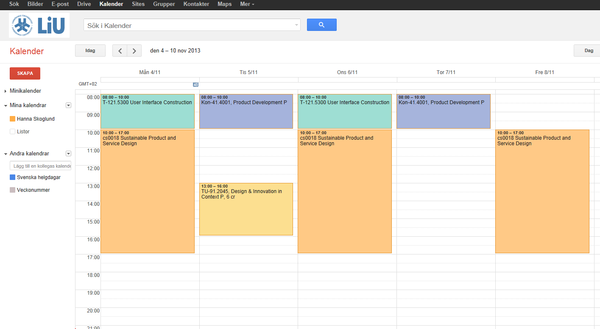 Dag 10: Finally done with my schedule! In my planning I have encountered many interesting course discriptions but due to prerequisites, overlaping, not overlaping but not enough time to move from one side of campus to another, wrong language of teaching etc. I have had to try to forget about some of them. In the process I have e-mailed quite a few professors. I have to give them credit for replying directly, usually within an hour! 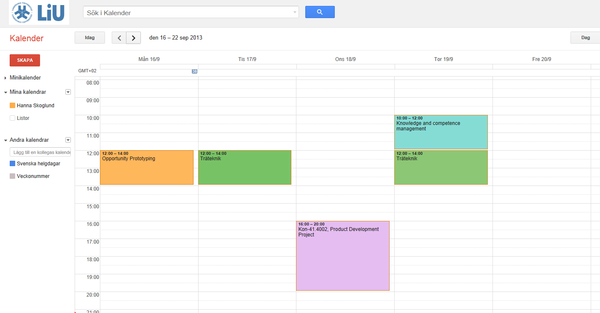 I hope that I can manage the second half of the semester. The light blue and the darker orange course are at different campuses with a 40 minute bus ride inbetween. Luckily the light blue course do not have mandatory lectures. First of all the cute little brewer makes the coffe amazingly fast. Too fast perhaps? Secondly the coffee filters that I found smells like tea. Could the filters be spiked with tea? 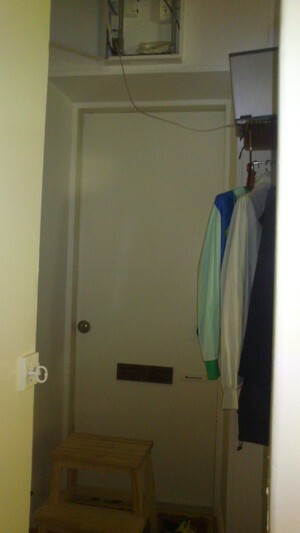 Another factor is that I cannot find any measurements in the appartment. 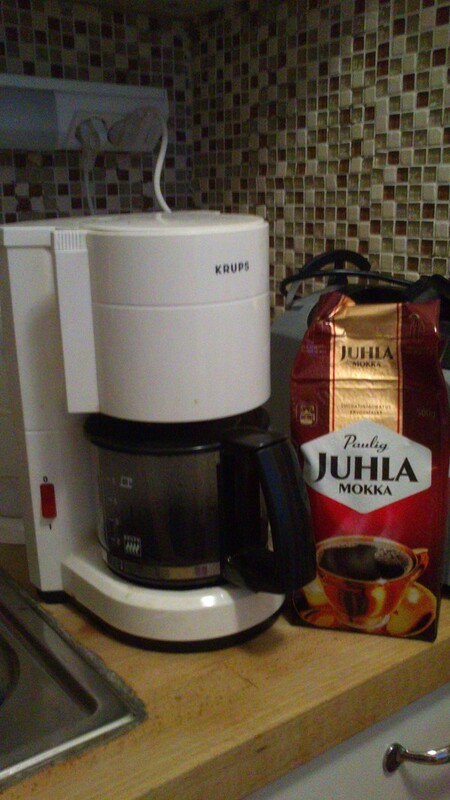 I have been experimenting with different fractions of coffee but the end result still tastes bad. 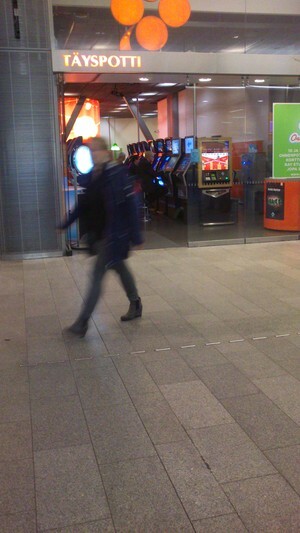 I keep wondering if gaming is more common in Finland, or if I for some reason just have started to pay attention all one slot machines I see. 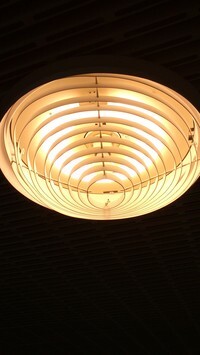 This picture is from the bus station where I take the bus to campus. I understand that restaurants have the slot machines but grocery stores?? Quite a few grocery stores have them right by the check outs. Yesterday in the grocery store at campus a woman was playing. I most definitely need to buy a longer cord for the Internet. 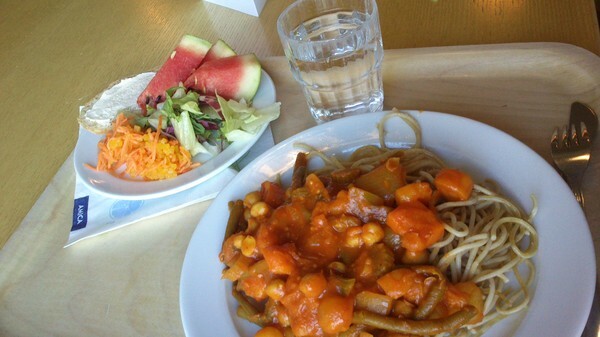 This lunch only cost me 2.60 € when I showed up with my new Certificate of Student Status. Not the greatest food I have ever eaten but pretty good. Thumbs up for newly baked bread and watermelon! In Linköping I would just get a Jochen (sandwich) for the same price. Perheps I can skip matlådor this year. Six years ago I had just moved to started school in a new country. Now I am about to do it again. It brings out a lot of memmories from back then, all cool new things the seventeen year old me got to experience, cotton fields, the huge WalMart, guys holding up doors etc. Earlier today I got nostalgic and took out my photoalbum that my host mom gave me and my high school yearbook. Looking at all pictures and kind inscriptions got me fuzzy and warm inside. I am so grateful for my year in North Carolina. I will NEVER forget it! I am excited to study in English again and discover a new country. Tomorrow at 6:35 the plane takes off and my next adventure begins. Packing this time was a lot easier. 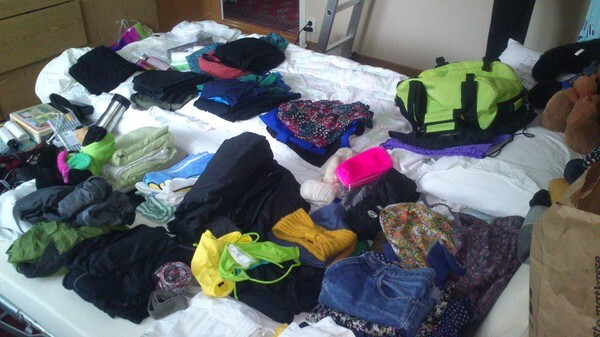 I know better what I can expect of the Finnish climate and I also like to consider myself as more of an experienced packer/traveller. It helped me avoid the unneccessary things. However, as long as I had space and was within the weight limit I took the chance to throw in some extra things in my luggage. For those of you who know me well know that I very happily added a teddybear, my watercolors, stationary and a stove-top coffeemaker.